Source Separation and Machine Learning presents the fundamentals in adaptive learning algorithms for Blind Source Separation (BSS) and emphasizes the importance of machine learning perspectives. It illustrates how BSS problems are tackled through adaptive learning algorithms and model-based approaches using the latest information on mixture signals to build a BSS model that is seen as a statistical model for a whole system. 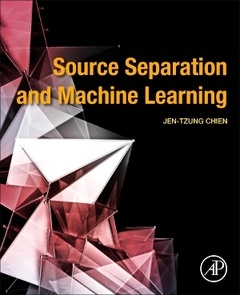 Looking at different models, including independent component analysis (ICA), nonnegative matrix factorization (NMF), nonnegative tensor factorization (NTF), and deep neural network (DNN), the book addresses how they have evolved to deal with multichannel and single-channel source separation. Jen-Tzung Chien received his Ph.D. in electrical engineering from National Tsing Hua University, Taiwan in 1997. He is now with the Department of Electrical and Computer Engineering and the Department of Computer Science at the National Chiao Tung University, Taiwan, where he is currently the Chair Professor. He was the visiting professor at the IBM T. J. Watson Research Center, Yorktown Heights, NY in 2010. Dr. Chien has served as the associate editor of the IEEE Signal Processing Letters in 2008-2011, the tutorial speaker of the ICASSP in 2012, 2015, 2017, the INTERSPEECH in 2013, 2016, the COLING in 2018, and the general chair of the IEEE International Workshop on Machine Learning for Signal Processing in 2017. He received the Best Paper Award of the IEEE Automatic Speech Recognition and Understanding Workshop in 2011 and the AAPM Farrington Daniels Paper Award in 2018. He is currently serving as an elected member of the IEEE Machine Learning for Signal Processing Technical Committee.